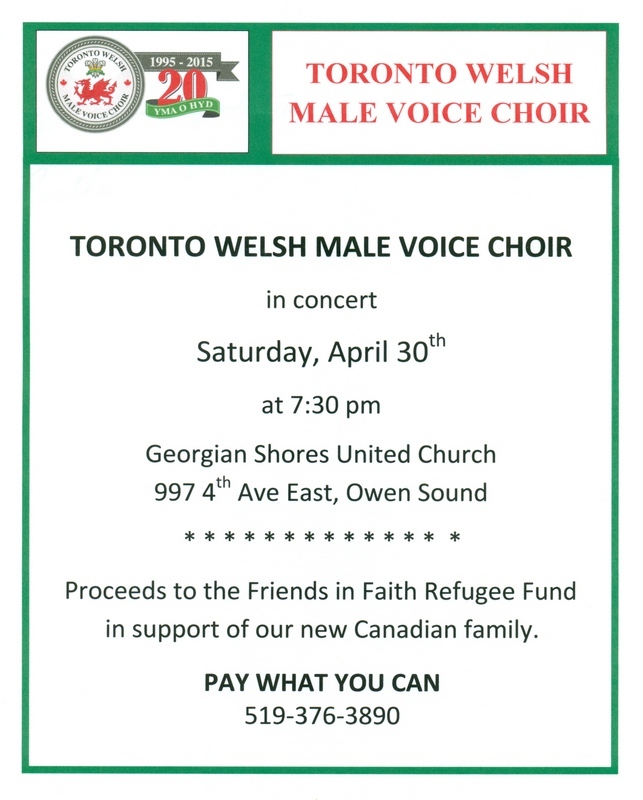 The Toronto Welsh Male Voice Choir is coming to Owen Sound and will perform at Georgian Shores United Church. We hope you will join us for this wonderful evening of music. The choir is on a mini-tour outside the Toronto area. The concert starts at 7:30 p.m. on Saturday evening but you will want to get there early to get a good seat. The proceeds from the evening, after the expenses are paid, will go to the Friends in Faith Refugee Fund to support our new Canadian family. The family arrived at the end of January. Thanks to everyone for their ongoing support. Pay what you can at the door. No ticket required.